Hey guys, I know that we shouldn’t still be wearing black, but we’re still mourning. 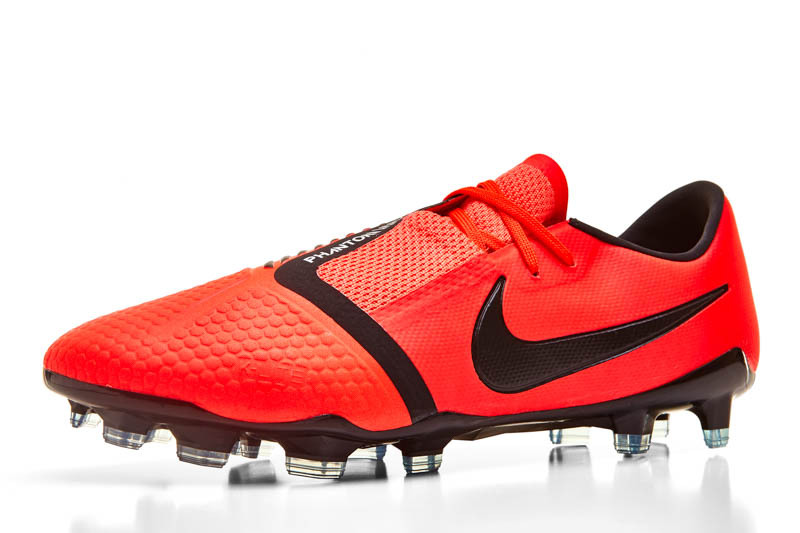 The Nike HyperVenom Phantom (excluding early versions of the II) was one of our favorite boots ever. Garnering awards with nearly every iteration of the Boot-ies, there is a special place in our hearts for the original Phantom. 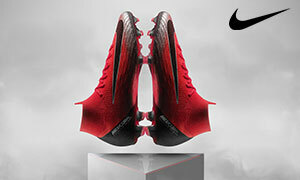 From the upper that naysayers claimed to look like paper towels (to be fair, it kinda did) to the fact that Nike called it an “agility” labelled boot though it was actually just a super fun boot to smash the ball, the HyperVenom Phantom was not a boot that we expected to be gone so soon. Enter the Nike Phantom VNM. A journey back to the power boots of Nike lore and the successor to the HyperVenom Phantom. A departure from the almost required collar that Nike boots have sported in recent years, but still representing the FlyKnit flag. 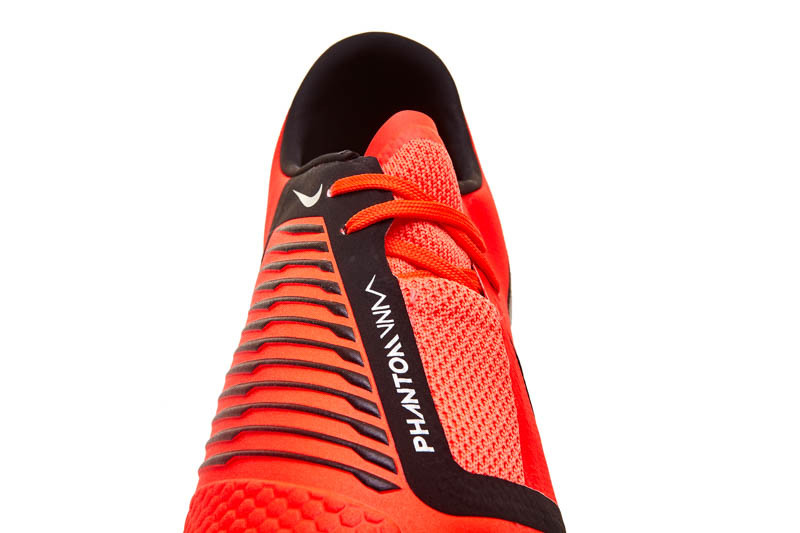 For anyone that has felt a slight hole in their heart with the T90 replacement of years ago, or were simply hoping for the HyperVenom Phantom IV, it will be a crazy ride to see if the Phantom VNM can check all those boxes. We’ve been testing these boots for a long time, let’s see if it can. The Phantom VNM does bear a striking resemblance to what we would imagine the next iteration of the beloved T90 series to look like. In fact, it’s quite interesting to see Nike choose to re-release the original T90 Laser around the same time as the introduction for the VNM. With no collared version, this boot certainly looks like a throwback to a bygone era. However, once you get past the silhouette, everything about this boot’s appearance is unique and modern. The forefoot of the boot is covered with a honeycomb type pattern. 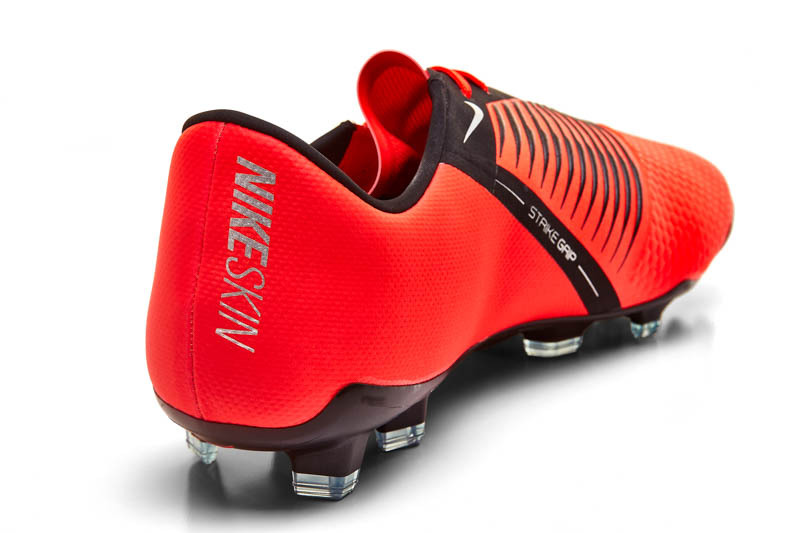 There is a slight texturing to it, but it might be a style choice to match up with the VNM name for this boot, the HyperVenom line (that this boot has descended from) has never been shy to tie in imagery from poisonous creatures. The midfoot has large sections on the opposite side of the boot that are covered in exposed FlyKnit material, and the other side of the boot has the VNM’s shooting element. To me, it has a look and feel like ribs from an old competitor, the Predator LZ’s and the Wave Ignitus III from Mizuno, it looks a bit more aggressive than the element actually feels. The last major cosmetic is the slight covering of the laces on the Phantom VNM. While it feels a little awkward visually, we’re certain that this is merely Nike trying to give as large a striking surface as possible. You don’t retire the HyperVenom Phantom and then drop a boot that won’t be fun to strike the ball with, right? Our last thought on look is how this shooting element, despite being really cool to look at, is actually fairly minimalistic for boots that employ this type of tech, it will be interesting to see if a boot that looks made for shooting can still, somehow, perform at a top level without going fin/rubber/shooting element crazy. The boot does come with a swanky boot bag to haul your new boots around, and we almost feel like the brands should band together to make it a requirement for top-tier boots to include a bag, extra insoles, or even both. Despite those looks telling our eyes that this wasn’t the next iteration of the HyperVenom III, actually lacing the boots up told a slightly different story. Once the boot started to get put into play, we actually found that this boot is definitely a worthy successor and definitely takes some serious inspiration from the recently deceased HyperVenom Phantom III. It might be called the Phantom VNM, but the name switch shouldn’t scare you away from a boot that impressively takes the mantle from one of our favorite boots of all time. 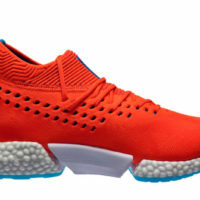 The forefoot does offer a great touch on the ball, and Nike has engineered this section to be a little bit grippier on the ball to help aid in control. We never really felt like the boot was ever truly getting stuck underfoot, but we did quite enjoy using the VNM whenever we tried to make quick cuts or flicks. There’s no telling whether that’s from added grip that Nike placed on the VNM, it might just be down to how clean the touch is when you’re on the ball. If a slightly wax-like forefoot does scare you, then the VNM isn’t going to be for you. Passing in the VNM shows picks up from the Phantom III in showing that this isn’t just a striker’s boot. 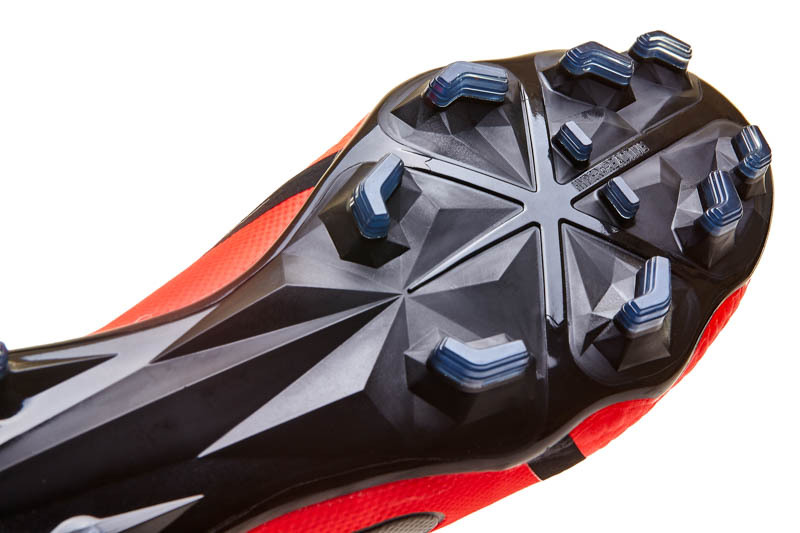 The thickness used across the entirety of the boot keeps you from ever feeling weighed down, like there’s ever too much between you and the ball, and gives that slight bit of padding players want when softening zipped passes, moonshots out of the air, or getting your foot stuck into a tackle. If you’re dribbling at speed, holding up play looking for that last killer pass, or trying to unlock a defense with a slick through ball or crossfield bomb, the VNM delivers the feel that will have you never doubting that your boots are going to deliver on whatever skills you can use. The biggest question about performance was absolutely going to circle around that shooting element. Inspired by the ridges sometimes seen on the head of a golf club, we went into testing with high hopes, but low expectations after all, I mean, come on, have we ever had a shooting element truly add more swerve or power to our shot? When we finally started trying to laser shots into the back of the net, we definitely felt that these moments are where the VNM is designed to shine brightest. No, the element didn’t suddenly have us bending shots better than we ever could and the sound barrier never seemed in danger of being broken, but that striking surface is second to none in the boot world. Every time that you absolutely connect flush with a ball, the contact you get is going to feel completely clean and the ball will absolutely leap from your foot. Whether catching the ball straight on, curling with the inside of the forefoot, or getting tricky with a bit of outside-of-the-foot action, every shot feels uniform, clean, and beautiful. The soleplate is unique to the Phantom VNM and is actually quite aggressive. We’d say to keep these fairly far away from artificial surfaces for those reasons, but FG players will never need to doubt whether or not they’ll be slipping and sliding while dominating for 90 minutes or during a routine practice. The chevron design that Nike has become rather fond of with their studs is certainly not for everyone, but it’s been a long time since any brand has given us a soleplate that has truly given us pause and the VNM is no different. The HyperVenom Phantom was capable of incredible comfort. From the original model being so soft via its incredibly thin upper to the perfectly crafted build of the last model available, the only time you had to suffer through pain was when you caught a two-footed tackle or had to suffer through too many days in between using your favorite toys. 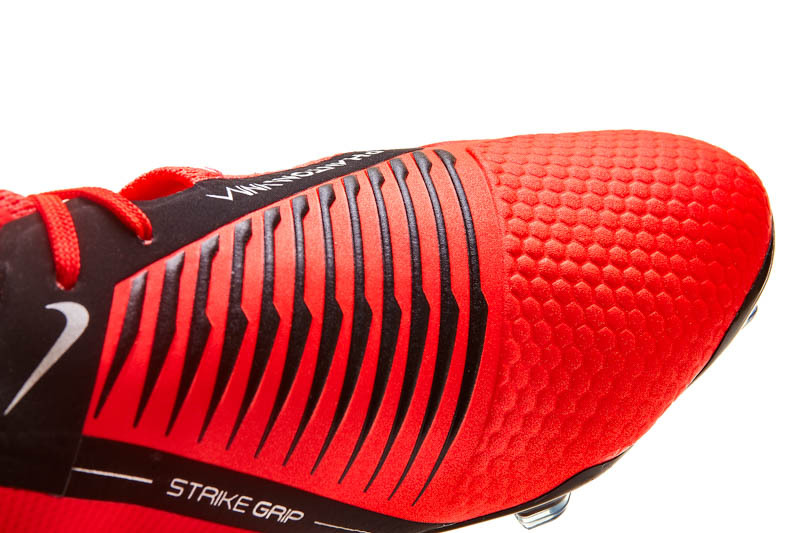 However, the upper has seen a significant visual shift, the soleplate set-up is different, and almost the only thing that reminds us exactly of the dearly departed HyperVenom is the large shooting surface. With all those plush memories tossed by the wayside, can the comfort for the VNM stand up? 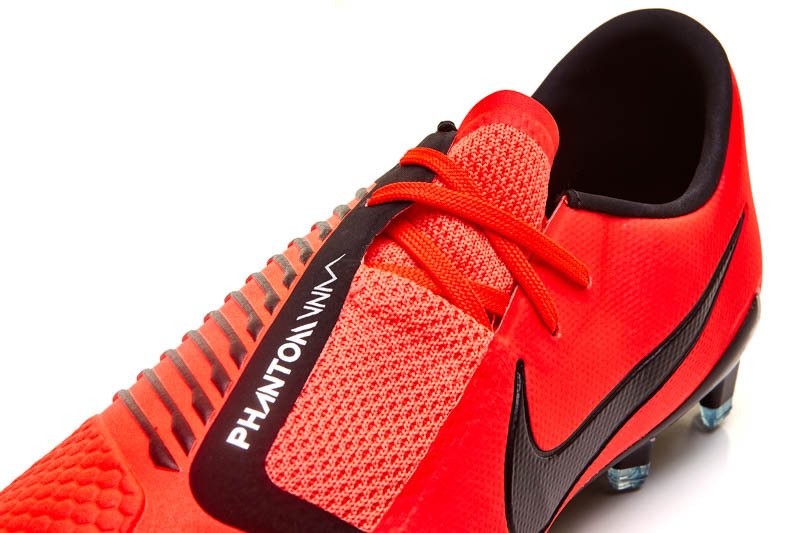 Luckily, Nike has seen fit to allow the Phantom VNM to continue on the path that the HyperVenom Phantom set forth. By employing a super soft stretch to the exposed FlyKnit portions of the boot (the entire boot is crafted with Flyknit, but only certain portions are left exposed to the elements…much like the boot’s predecessor) you get that lovely stretch, but the FlyWire cables that run around the boot from the laces means that you can lace these boots up and feel completely locked in place. We found that the VNM fits true to size during our time with the boot. 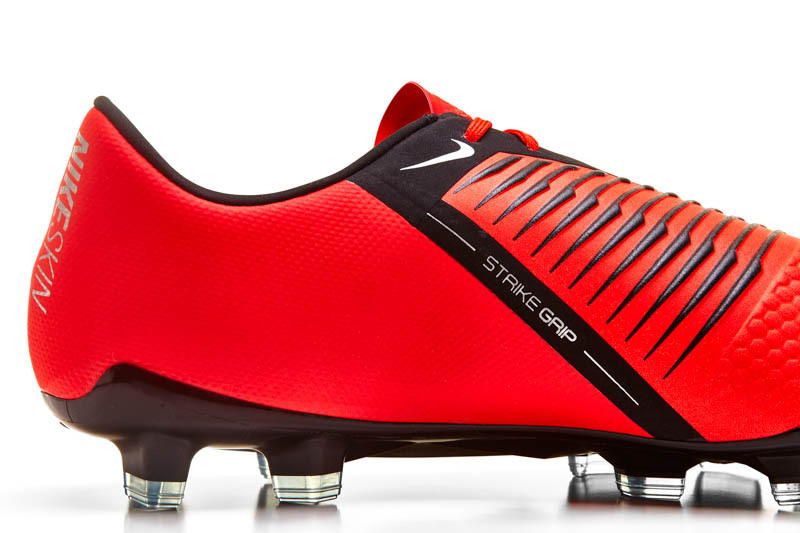 This also might be one of the more accommodating boots on the market. It still isn’t going to be a great choice for super wide feet, but most foot types out there should be able to find a comfortable home in the Phantom VNM. The Phantom VNM came straight in and snagged a large portion of the athletes that were wearing the HyperVenom Phantom. From Harry Kane, Marcus Rashford, Gonzalo Higauin, to even Wayne Rooney, they’ve all made the switch to the newest model in the Nike stables. As the boot ages, it will be interesting to see if players opt for the VSN or VNM moving forward. We’re a little partial to the VSN because of how incredible that boot is, but the VNM is an easy boot to suggest for anyone hunting for its particular set of skills. Because Nike has chosen to leave the collar off their newest experiment, the Elite version of the Phantom VNM actually will cost you a fair bit less than most of the other Nike Elite models. While retail for the Phantom VNM Elite sits around $250, sites like Soccerpro.com can get you these bad boys for much closer to $200. For us, having been around the block a few times, this is much closer to the sweet spot for top tier models. Considering the quality this boot boasts, it shouldn’t be too tough a decision if your wallet has the right flex. The Phantom VNM is another quality option from the crew over at the Swoosh. It seems to offer up a high level of comfort while providing the sweet strike that drew many to the HyperVenom Phantom originally. Add in the blend of power boot with the lightweight construction that nearly all boot models tend to boast today, and you’ve got yourself a great option for yourself as you head into your next season. The only real negative in my view is: what’s with Nike’s last two boot names? VSN and VNM? How much was spent in R&D to come up with those? Just my opinion of course. Lastly, how did Nike give us a boot so close to the HyperVenom III with it looking almost nothing like its source material? It’s amazing! No matter how they did it, we’re a fan. Snag yours today!